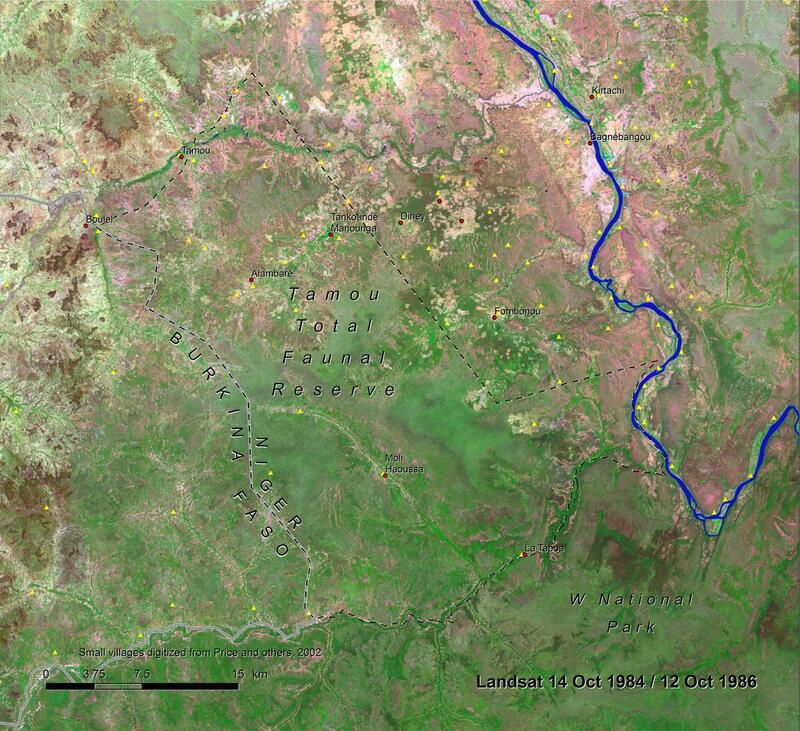 The Tamou Total Faunal Reserve was created in 1962 to serve as a buffer zone for the W National Park of Niger and for the large transboundary W Regional Park that it is a part of. The reserve is located in the Rural Community of Tamou in Niger’s southwestern corner. Initially covering 1,400 sq km (Bouamrane, 2006), the legal area of the reserve was reduced to only 760 sq km in 1976 when its eastern zone was decommissioned (Benoit, 1998). The Government of Niger decommissioned half of the reserve in response to food insecurity. 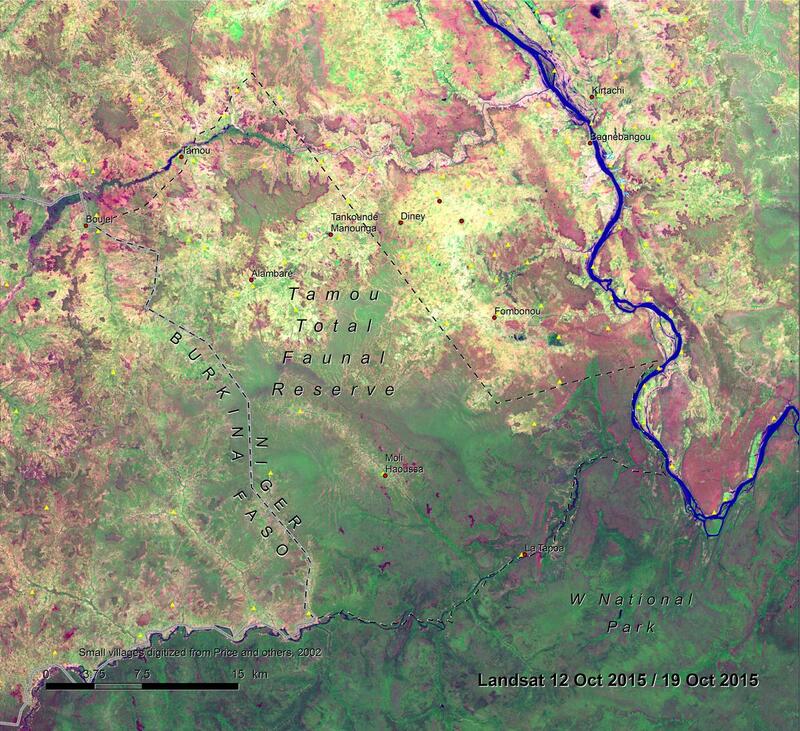 This triggered a dramatic migration of people to this area along the Niger River floodplain where fertile soils and availability of water promised economic opportunity. Uncontrolled establishment of new villages and farms lead to the loss of large areas of relatively natural savanna habitat. The W National Park and Tamou Reserve fall in the transition zone between savanna and woodlands in the Sudano- Sahelian biome. Tamou Reserve’s natural habitat is made up primarily of shrub savanna and wooded savanna with gallery forests running along the seasonal watercourses. The hundreds of native plant species in the two parks historically supported a range of fauna including elephants, lions, hippopotamuses, hyenas, cheetahs, warthogs, baboons, caracals, red and green monkeys, and a variety of aviafauna (UICN/PACO, 2010). The natural flora and fauna are being lost as population pressure converts valuable habitat to farmland and villages. The Landsat images show the expanding area of farm fields and villages between 1986 and 2015; most of this change followed the decommissioning of the reserve (Price and others, 2002). The changes are especially apparent surrounding the named villages in the top center of the images. A study of pressure on the W Regional Park identified settlements surrounding the international park’s perimeter (Price and others, 2002). The yellow triangles show the settlements they identified in the area around Tamou Reserve, most of them described as recent or new (as of 2002). Despite the strong presence of rangers in the Tamou Commune, who are there to enforce rules protecting the remaining reserve area, illegal activities persist, including clearing bush for new fields, poaching of both small and large game, illegal transhumance, felling of protected trees, and deliberate setting of fires.